Centre of Innovative Technologies is brain child of the Chairman of the Group Dr. P.S. Bisen, an avid researcher and scientist himself, he aims towards motivating all within the group, students and faculty alike, to think innovatively and create and generate new ideas. This department encourages and invites participation from all the other departments, to think out of the box and submit their ideas. 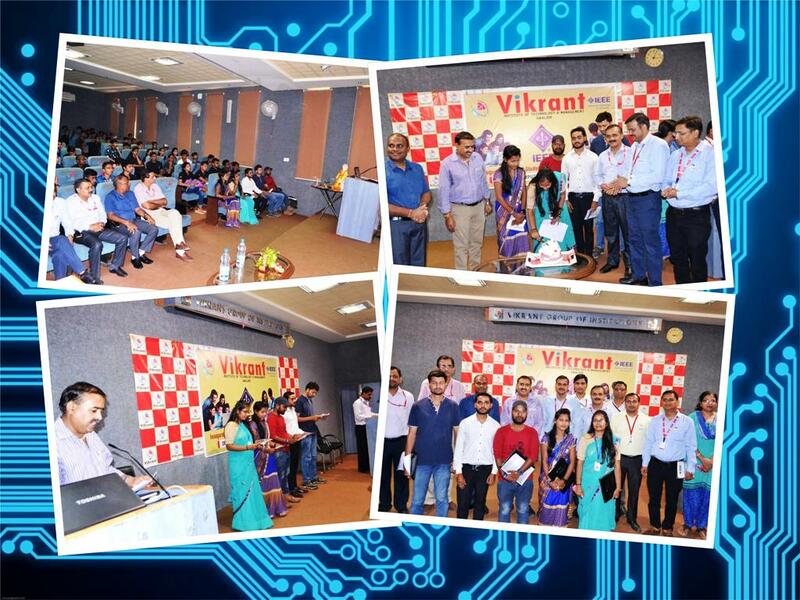 Center of Innovative Technologies is centered on promoting the ingenious ideas of individuals or groups or departments, of Vikrant Group of Institutions. As inspiration, an aspiration, an attitude, a pursuit, a way of life. All working together, aspiring to the fullness of our potential, always in pursuit of a higher standard -determined to do, everything we do, somewhat better than it ever has been done before. Found in the caring, in the trying, in the doing. It is our objective. We seek it with dedication. It is the name of our team. "Development of diagnostic kit for early and rapid detection of pulmonary and extrapulmonary tuberclosis and its evaluation in health centers"
The try-copter is three rotor helicopter that contain electronic & mechanical structure, RF modules for communication interfacing with hardware & operator. It contain rotor, motor, electro-mechanical controller, camera, and body frame. Three rotor is the new technology for helicopter which provide easy controlling low power consumption than quad rotor, maximum lift, fixed rotor that give no complex for blade movement. Only motor speed control give movement. The basic structure of finger print scanner consist of finger print sensor and the analytical circuit which compared the scanned finger print with the stored finger print of the employs in the database of organization & store the time of arrival and attendance of employee. Neurotechnology has released a new line of embedded biometric technology, including Verifinger embedded SDK for fingerprint biometrics, Verilog embedded SDK for face biometrics & Mega matcher embedded SDK for multi-biometric systems using face & fingerprints in combination. This project is based on detecting alcohol present in the body of a person or specifically in a driver. The project is implemented with a four wheeler’s ignition system. An alcohol sensor may be fixed to the steering of the vehicle. It senses the alcohol vapors from the mouth of the driver. The amount of alcohol content sensed by detector i.e. the response is converted into the digital value and transferred to microcontroller. The LCD is given to show the alcohol content on the screen. The microcontroller is programmed such that if the alcohol content in driver’s body exceeds precised level .it turns the ignition off through the relay, so that the car won’t start. The sensor which we are using in this project is MQ3 which sense alcohol vapors from the mouth of driver & converted the sensed vapours into digital value & transfered it to the microcontroller. DTMF mobile ROBO is a machine that can be controlled with a mobile. In this project,the robot is controlled by a mobile phone that makes a call to the mobile phone attached to the robot. In the course of a call, if any button is pressed, a tone corresponding ti the button pressed is heard at the other end of the call.This tone is called “Dual Tone Multiple-frequency”(DTMF)tone. The robot precives this DTMF tone with the help of the phone stacked on the robot.The received tone is processed by the microcontroller with the help of DTMF decoder. In this project the robot,is controlled by a mobile phone that makes call to the mobile phone attached to the robot in the course of the call, if any button is pressed control corresponding to the button pressed is heard at the other end of the call.this tone is called dual tone frequency tone (DTMF). DTMF signaling is used for telephone signaling over the line in the voice frequency band to the switching center.The version of DTMF used for telephone dialing is known as touch tone. DTMF assigns a specific frequency (consisting of two separate tones)to each key that it can easily be identified by the electronic circuit. The signal generated by the DTMF encoder is the direct algebraic submission, in real time of the amplitudes of two sine(cosine) waves of different frequencies. The security system will inform you immediately with SMS(text) message your mobile when “unauthorized guest”enters yours premises.System includes GSM module and Passive Infra Red senser(PIR) The entire device is contained within a small plastic enclosure and it looks like simple PIR motion detector. The system supports the contact ID protocol which is required to transmit signal to a security satation.All configuration can be programmed using the IR sensor configuration Tool program IR868 version with installed 876MHZ radio transmitter-reciever can operate as an access point wireless devices. DTMF mobile ROBO is a machine that can be controlled with a mobile.In this project, the robot is controlled by a mobile phone that makes a call to the mobile phone attached to the robot. In the course of a call ,if any button is pressed,a tone corresponding to the button pressed is heard at the other end of the call. This tone is called ”Dual Tone Multiple-Frequency”(DTMF)tone.The robot perceives this DTMF tone with the help of the phone stacked on the robot. The receives tone is processed by the motor driver IC stop operate the motor& our robot starts moving. The latest technology used in this project is the use of DTMF.The DTMF technique outputs distinct representation of 16 common alphanumeric character(0-9,A-D,*,#)on the telephone. The lowest frequency used is 697HZ and the highest frequency used is 1633HZ. The DTMF keypad is arranged such that each row will have its own unique tone frequency and also each column will have its own unique tone frequency. This project deals about an advanced hi-tech wireless notice board.This project is built around the AT89C51microcontroller from Atmel.This microcontroller provides all the functionality of the display and wireless control. Alphanumerical keypad is interfaced to the transmitter to type the data and transmit.This project uses regulated 5V,1Vpower supply,7805 three terminal voltage regulater is used for voltage regulation.Bridge type full rectifier is used to rectify the AC output of secondary of 230/12V step down transformer. The message can be transmitted to multi point receivers. After entering the text ,the user can disconnect the keyboard.At any time the user can add or remove or alter the text according to his requirement. This project gives us a fingerprint based attendance system with 8051 microcontroller. The fingerprint module is used for fingerprint matching. It can store a max of 768 fingerprints.The admin can add/delete records from the PC through the VB application.All the attendance details and photo diode to sense the finger placed over the fingerprint module. All the attendance details are store over the PC.The admin can generate reports and he can print the reports. The fingerprint technology can be modified to Biometric Identification for enhancing the security systems. Authors of the book are Mr. Rahul Pratap Singh Kaurav, Asst. 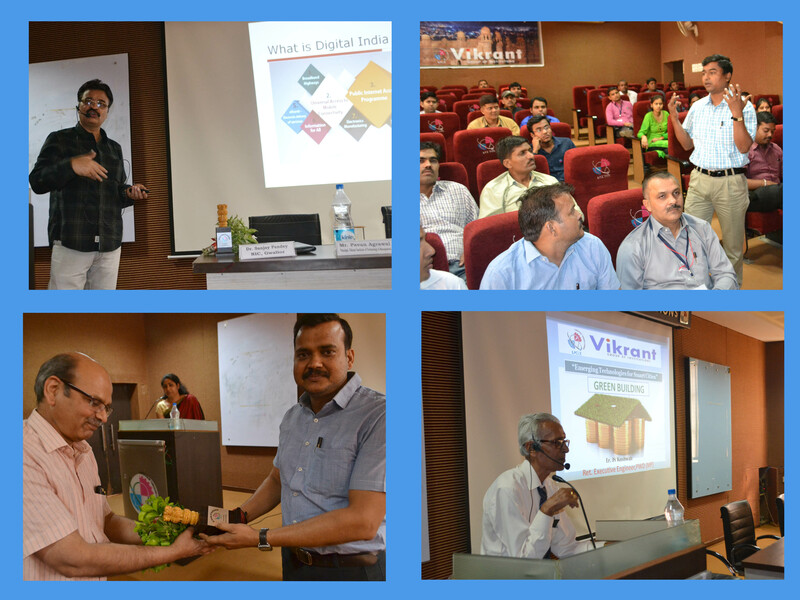 Professor, Vikrant Institute of Management; HoD, VIILAS, VGI, Gwalior and Mr. Ramavtar Singh Tomar, Asst. Professor, Vikrant Institute of Management, Gwalior. The book is unveiled by Prof. Sudhir Singh Bhadoriya, Director, SGITS; Mr. R S Rathore, Chairmen, VGI; Mr. KK Mishra, Director, VITM, Indore; Mr. RPS Kaurav and Mr. RS Tomar on May 9, 2012 at Vikrant Group of Institutions, Indore. About the book: The marketers need to create opportunities,identify the profitable areas and practise innovative marketing principles in order that a fair synochonisation of social and commercial considerations is made possible. The book substantially contributes to the mainstream of knowledge on the different areas of marketing which attends to almost all the vital facts of the emerging trends with clarity and perspicacity. The marketing managers, Faculty, the students of M.B.A,M.Com, B.BA and other professional course would find the book useful in many ways. Key feature of this book is that it has Indian cases, some of them in detail. This provide much choice to select suitable cases for discussion. Besides these cases also serve as more and detailed examples portraying real life business situation and offer deep insight to students into marketing. Vasim Khan has been working as a Head of Electronics and Communication/Electrical Engg. Department in Vikrant Institute of Technology and Management,Indore.He has Published three books on Electromagnetic Theory,Network Analysis & Synthesis, Electromagnetic Field wave for Punjab Technical University Jallandhar & R.G.P.V University Bhopal.Presenty he has Published Electromagnetic Theory Book for R.G.P.V University Bhopal which is one of the most popular among the students of different Engineering colleges in (M.P).His areas of interest are Basic Electronics,Digital Signal and Processing,Network Analysis & Synthesis and Control system. The book covers the complete syllabus of “Electromagnetic Theory” by most for the universities in India.The book uses simple and easy language to explain basic fundamentals of this subject.The book provides logical method of explaining various complicated concept and stepwise method specially for undergraduate technical students,but also helpful to the students of Post graduation and those who are preparing for various competitive examinations like GATE,IES ,DRDO,ISRO,SAIL,BHEL etc. The uniqueness of this book is to include in each chapter is well supported with LMR(Last Minute Revision) which is very helpful for the students for quick revision of each chapter.Problems associated with Electric field and Magnetic field Theory approaches for solving the Electromagnetic problems are given in details. The book is complete in all respect and very useful not only to the students but also to the subject Teachers. International Conference on Signal Processing, Communication, Power and Embedded System (SCOPES) – 2016 [IEEE Conference], is being held in Centurion University of technology & management, Paralakhemundi, Odisha, India during 3rd to 5th October 2016. The main aim of this conference is to provide an excellent international forum for sharing knowledge and results of research work. The conference will also provide a platform for researchers in academia and industry to exchange ideas in the cutting-edge developments that are taking place around the world in specific domain. The conference is proposed to be held at regular intervals to make it an ideal platform for scholars to share their views and experiences and to keep abreast of the latest trends and ongoing research in the field. In this conference, our college was participated as a special session. In this session, we have presented 09 research papers. In this Conference, All papers will be published by IEEE Xplore. As well as indexed by SCOPUS. 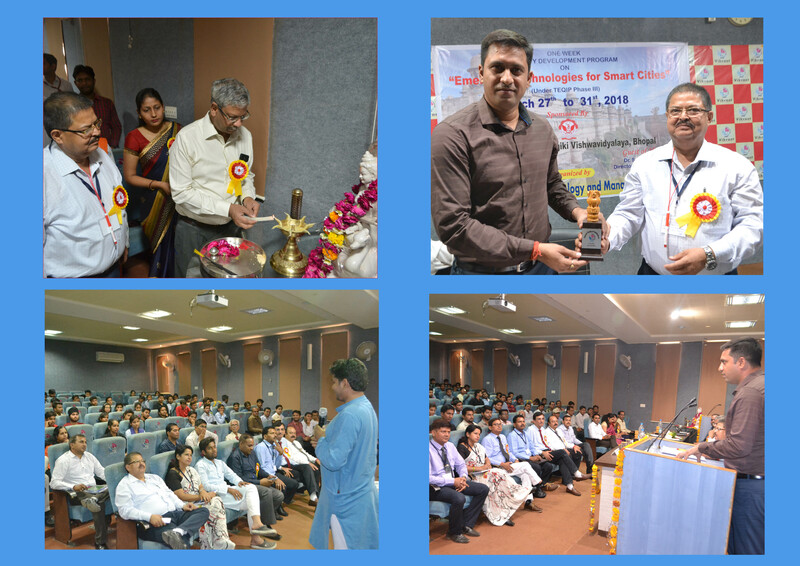 ICEEOT-2016 [IEEE Conference], is being held in DMI College of engineering Chennai, Tamil Nadu, India during 3rd to 5th march 2016. The aim of the conference is to bring Students, Engineers, Researchers and Scientists to single platform for share their knowledge and ideas in the recent trends in the field of Engineering, Science and Technology. In this conference, our college was participated as a special session. In this session, we have presented 27 research papers. Also three faculty members, named as Prof. Pavan Agrawal, Prof. Anand S. Bisen and Prof. Manish Gupta, was played as a session chair role and taken presentation in three different conference halls of different students coming from different states. and Session coordinator is “Prof. Anand Singh Bisen”. 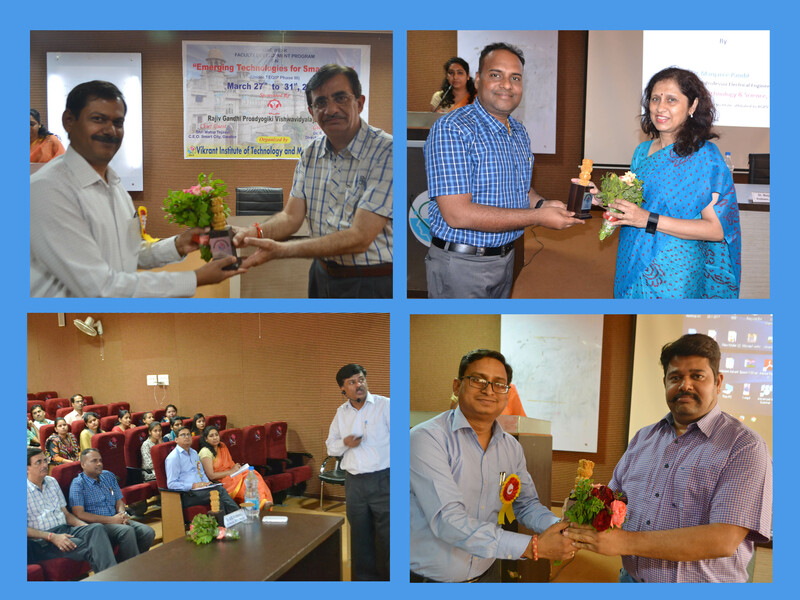 A two days international conference on Social Networking and Computational Intelligence in association with Springer was held in RGPV, Bhopal on 8th and 9th March 2019. In this event Vikrant Group of Institutions was the only one from Madhya Pradesh to chair as Special Session and presented 18 research papers . 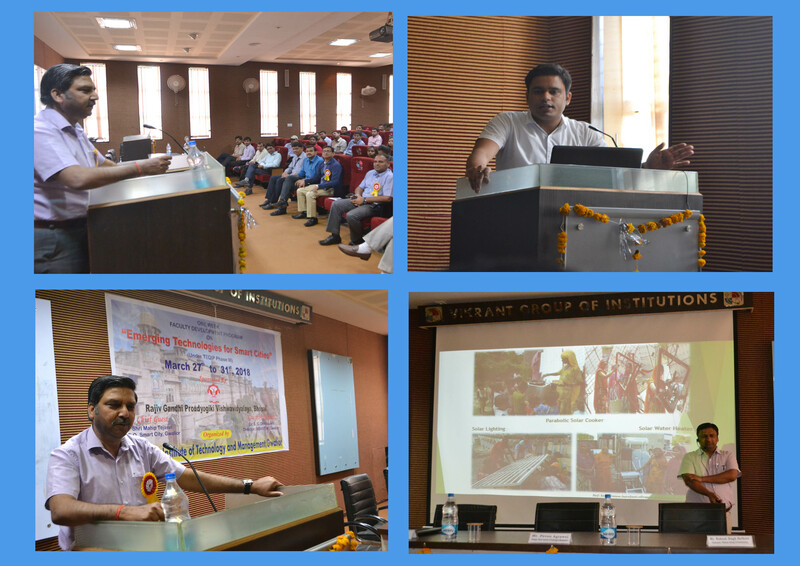 In the event Computer Science department's Head Prof. Anand Singh Bisen presided as Session Chair. Vikrant Group Of Institutions, Gwalior was trying to establish a CSI Student chapter in it’s premises since last month, and we are very delighted to announce that we have inaugurated CSI Student Chapter in our organization on 27th Feb 2016 . VGI,Gwalior is always keen to give new opportunities to its students for learning and adapting new technologies and innovations and help them to grow as excellent human resources. 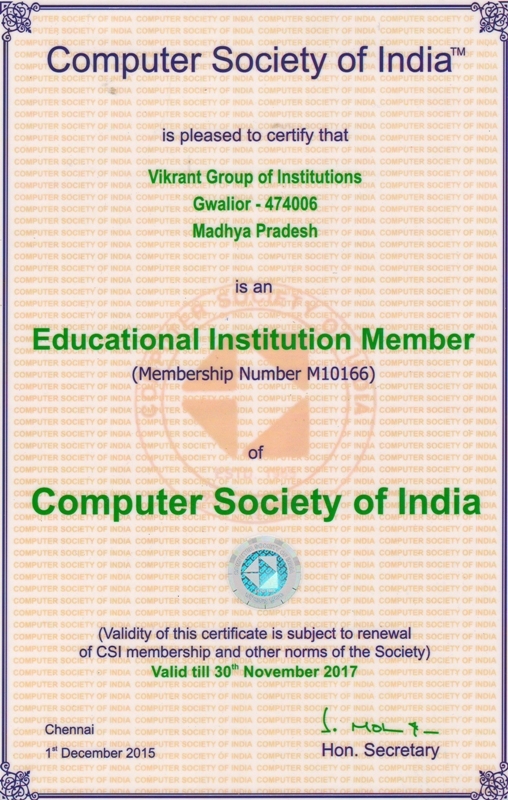 With the same moto the organization initiated Student Branch Of CSI, with the total number of 75 students from B.E (C.S.E/IT,ME,EC,EE,CE),MBA/PGDM. 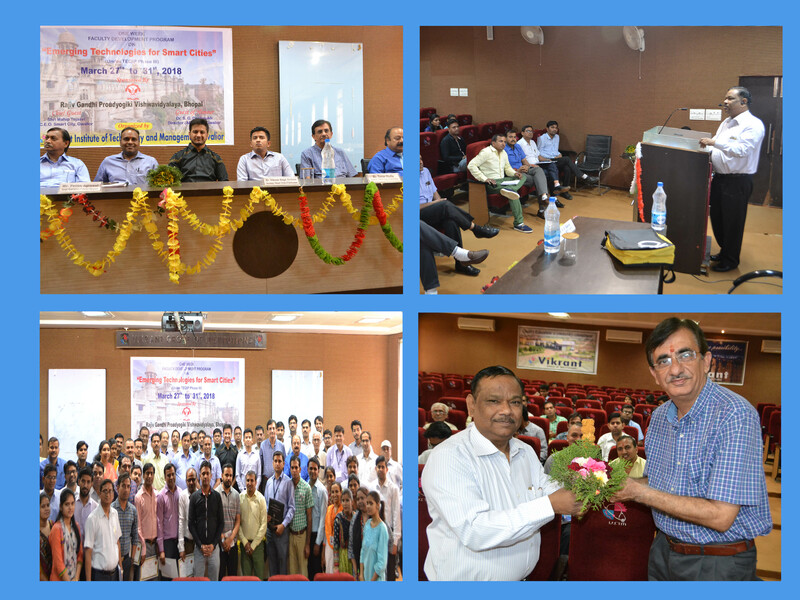 Vikrant Group of Institutions, Gwalior was trying to establish a IEEE Student chapter in it’s premises since few month, and we are very delighted to announce that we have inaugurated IEEE Student Chapter in our organization on 03rd Oct 2018 . 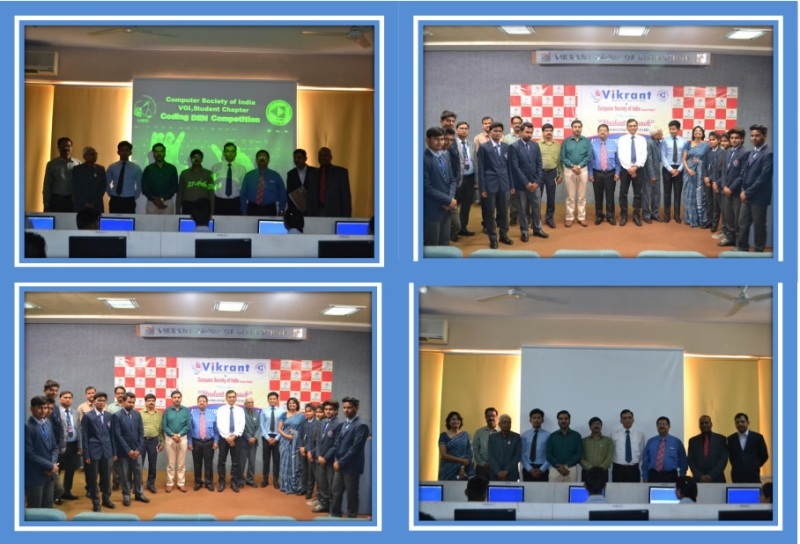 VGI,Gwalior is always keen to give new opportunities to its students for learning and adapting new technologies and innovations and help them to grow as excellent human resources. With the same moto the organization initiated Student Branch Of IEEE, with the total number of 12 students from M Tech. (CSE/IT,EE,ME,CE).